I seem to be on a roll with these beauty-related posts lately! Today I bring you another mini-review (I call them mini-reviews because mine aren't as detailed as most blogs, also not as objective), this time of this cute little palette I got from the CANMAKE Spring/Summer Product Launch, the Perfect Stylist Eyes Palette in 06 Gelato Mint. The palette, up close. Look at those pretty pastels! Swatches. All of the colors are shimmers, but the topping jewel seems to be a mix of shimmer + tiny glitters. The Perfect Stylist Eyes palette can be used two ways: natural makeup and bright makeup. The natural style color (baby pink) can be used for natural looks, and the bright style color (mint) for more glamorous looks. In my opinion though, since mint is such a fun summery color, you can use it for daytime looks as well. 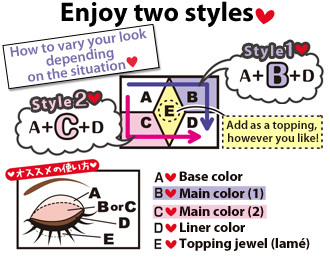 Following the diagram, I tried doing both the natural and the bright / glamorous looks on myself! Natural look. Used only the Perfect Stylist Eyes palette. Wearing GEO Hurricane Grey Lenses* c/o LensVillage. Bright look. Used the Perfect Stylist Eyes palette + K-Palette Real Lasting black eyeliner. Isn't the mint color nice? At first I didn't know how to use it since I normally don't use such bright colors for my eyes (I only ever use neutral colors), so I was quite surprised at myself for liking it! My favorite 'color' is the topping jewel though. I use it all the time now. It makes my eyes look super sparkly! Overall, it's a pretty good palette. The only thing I don't like about it, I think, is the fallout from the mint color. (I'm not sure if there's fallout from the other colors; if there is I don't think it's very noticeable..) Other than that, this is a really nice palette to have. Also, it's super cute and looks like ice cream (the name of the palette is Gelato Mint after all)! I think that alone is a good enough reason to want to buy this, haha. Perfect Stylist Eyes palettes is available online on the Canmake Philippines shop for PhP770. This particular palette isn't available anymore though, but the other colors are just as pretty! DISCLAIMER: The products in this post were sent to me by CANMAKE Philippines for review, but the opinions expressed here are 100% my own. Financial compensation was not received for this post. Please see my full disclaimer for more information.